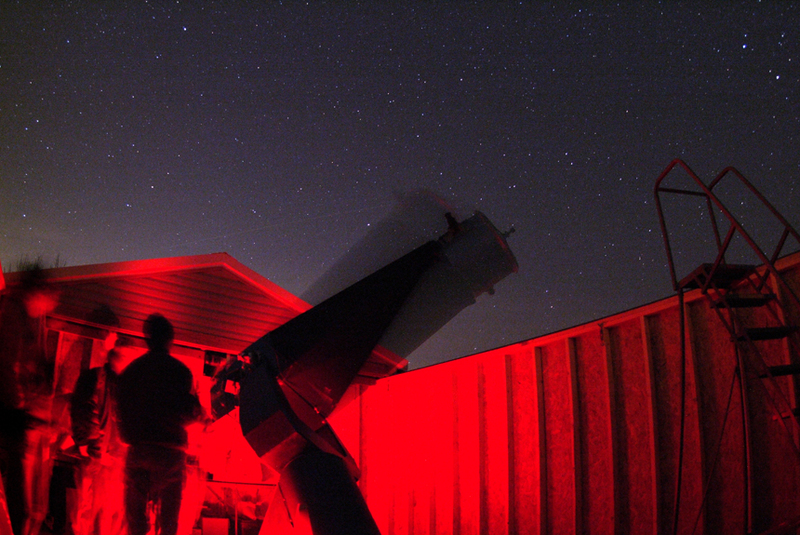 The Northern Cross Science Foundation operates a complete astronomical observatory at Harrington Beach State Park near Belgium, WI. From this peaceful location, we are able to pursue a variety of astronomical studies and conduct several education and outreach programs. Eighteen years in the making, the 20-inch Panarusky Telescope is ready to show you the heavens. The first public showing of this research-grade telescope occurred on Thursday, May 16, 2002, at Carlson Tool & Manufacturing. That day was a very special day for everyone involved in the project, and we have a page devoted to the first light activities. Weighing over 2,000 pounds, the Panarusky Telescope is designed to provide an extremely stable platform for instrumentation. The telescope will accommodate four foci: two Newtonain, one Cassegrain and one Coude. The telescope is named for its primary benefactors, Alvin and Hilda Panarusky of Port Washington. The telescope was initially designed by Robert Sedgwick, a retired mechanical engineer who once designed machine tools at Kearney & Trecker. In his Mequon design studio, he created a telescope that will meet and exceed the precision necessary for astronomical study. All of the mechanical parts were made locally, with most of the work being performed with machine time donated by Carlson Tool & Manufacturing in Cedarburg. The 20-inch full-thickness primary mirror was purchased second-hand and reground to the correct f/4.5 curve by the membership. 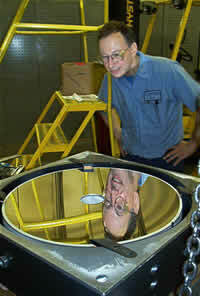 Final finishing of the optics was performed in Utah by Steve Dodds of Nova Optics. We have tested it ourselves and found it to be excellent. The telescope has had some recent design modifications, including a unique 2-position Newtonian secondary mirror and the only liquid-cooled primary mirror cell that we know of in an amateur telescope. Our venerable 12-inch Byers clock drive gear set has been adapted onto the new polar spindle. This provides highly-accurate tracking for the telescope in Right Ascension. A Sky Commander system from Florida’s Sky Engineering provides computerized pointing of the telescope to any location in the sky. 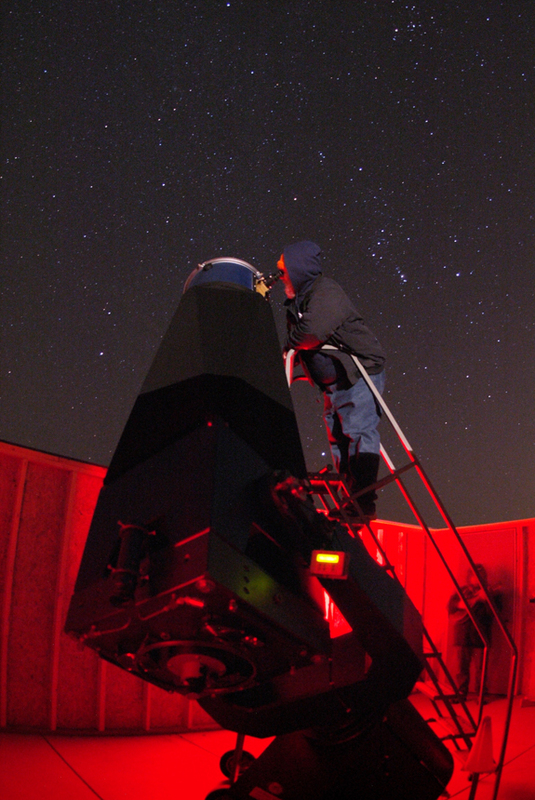 The Jim And Gwen Plunkett Observatory was dedicated on July 21, 2007. This is a roll-off roof design: the roof actually rolls off of the building on heavy rails, exposing the full sky to the observers inside. This observatory was built by Backyard Observatories and was their largest project to date. the observatory houses a home-built 10″ Dobsonian, 9.25″ Celestron SCT, a 6″ Criterion Dynascope, and the example instrument from our latest solar telescope-making class. Multiple doors on the north and south walls allow for easy “traffic flow” through the observatory when large groups are present. The Panarusky Telescope sits on a large concrete pier buried six feet into the ground which is physically isolated from the rest of the floor. If you use the free software program Stellarium, you can download a landscape graphic to show the observatory grounds (thanks to member Harvey Sherman).